'Boosting' your immune system is a terrible idea. We often hear ads trying to sell us a product to “boost” our immune systems. Magazines offer “9 Power Foods That Boost Immunity” and Dr. Oz has a list of “14 Natural Immunity Boosters.” Even Food Babe talks about how to “boost” your immune system naturally (spoiler alert: she loves turmeric). And on the surface it makes sense! Why wouldn’t you want to put nutrition in your body that is more able to help your immune system function and give it that boost you need to get through flu and cold season? While we’re at it, we can even get some Emergen-C, as their water literally transforms lives. Which I guess is technically a very correct statement – it can either keep you from dying of dehydration or it can drown you and and kill you. Both count as transformations, I guess. But what does that actually mean? What does it mean to “boost” your immune system, and what method is used to do so? One means is by vaccinating yourself. Vaccines strengthen your immune system’s response to a pathogen. Plus, vaccines work. Period! You can ensure your body and immunity run smoothly by rounding out your plate with plenty of colorful servings of fruits and veggies, plus 8 to 10 glasses of water a day, at the very least. So you just need to eat a normal diet (with fruits and veggies) and drink a lot of water? How simple! I eat like a normal person most times, but have you ever heard of pizza and cheeseburgers? Because: amazing. We get most of the water we need from the solid food we eat. If you’re thirsty, then drink! But there is no evidence indicating you need to drink half a gallon of water a day. 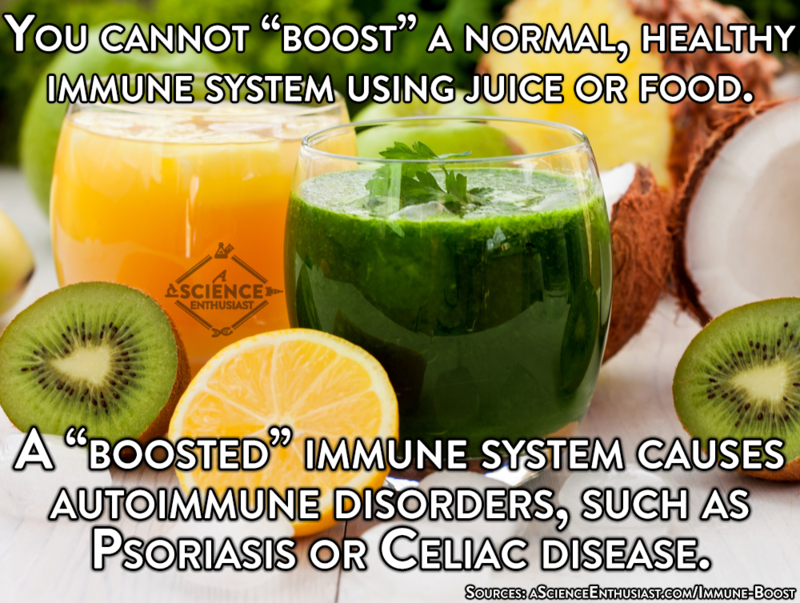 So ultimately, it comes down to the fact that you cannot “boost” your immune system. Proper nutrition and sleep help you to be healthier, but supplements, special drinks, and “organic” foods are not going to give you a “boost.” In fact, it would be terrifying if they did, as boosted immune systems cause autoimmune disorders such as allergies, Celiac Disease, Psoriasis, Crohn’s Disease, Lupus, and more. In the case of Celiac disease, certain foods actually do boost your immune system – but in a negative way. Celiac disease is a hereditary disease affecting about 1% of all people. When a celiac consumes gluten, the body’s immune system attacks the small intestine, causing pain and inhibiting nutrient absorption. This is the result of a “boosted” immune system. And while non-celiac gluten sensitivity isn’t a thing, my celiac friends thank those who claim to have it, as it’s given actual celiacs more gluten-free options at the grocery store. Just by virtue of being alive and breathing, you are constantly exposing yourself to bacteria, viruses, fungi, parasites, and other interesting pathogens like prions. When an antigen enters your body, a healthy person’s immune system is able to counter most of these threats without a problem by creating antibodies that bind to the antigen while ignoring other (putatively healthy) cells. You have white blood cells (lymphocytes) throughout your blood that do this. Your B cells produce the antibodies which tell your T cells to destroy cells that have been compromised. You have organs all over your body that function as part of your immune system, such as your tonsils, adenoids, thymus, spleen, appendix, bone marrow, and lymph nodes. This publication gives an excellent overview of the complexities of your immune system and how it responds. If it were true that our immune system is so sensitive that a shake could significantly impact it, it means that other foods would have an equally detrimental effect. So in essence, any type of junk food you eat would suppress your immune system. Does that mean we’d all end up eating kale pizza? There’s a special place in atheist hell for people who put kale on pizza. That just doesn’t make any sense, because that’s not how it works.